Last nights high tide created a theatrical display of crashing waves for the spectators perched up on the high ground over looking Towan beach in Newquay. Two hours before high tide i went down to the beach with my camera in anticipation of these giant waves hitting the coast. I hadn't expected to see these giant waves already lapping over the sea wall and crashing onto the pavement on the promenade. As the time ticked by the waves were getting bigger and bigger and I soon had to leave the spot I had chosen for taking pictures as the waves were crashing up so high I feared getting wet. I found higher safer ground to watch the waves until high tide hit. The event was spectacular, waves crashing up 10+ foot in the air, the waves were laden with rocks and pebbles and was spitting them all over the promenade and even hitting the street lights above making little clanging sounds to add to to thunderous crashes of every wave. As I watched with excitement but also fear the waves were surging in faster and harder with every set and it wasn't long before the wall that was damaged just three weeks ago by another powerful storm was smashed over. The granite stone wall would have weighed a tonne and this was carried by the waves down the road. Several cones, barriers and work tools left by the work men repairing damage from the previous storm were swept away. As the storm swell and high tide reached it's peak and after four hours of photography I could no longer feel my fingers and toes and decided to head home. Before heading home I took one last walk to where I was photographing previously and I was shocked when I saw what had happened. There were several coastguards on the steps to the beach about halfway down and they were shining a torch at the promenade, then I caught my first glimpse of the destruction caused in just a few hours. There was now a massive hole in the promenade where waves had worked there way through and taken everything from underneath it! 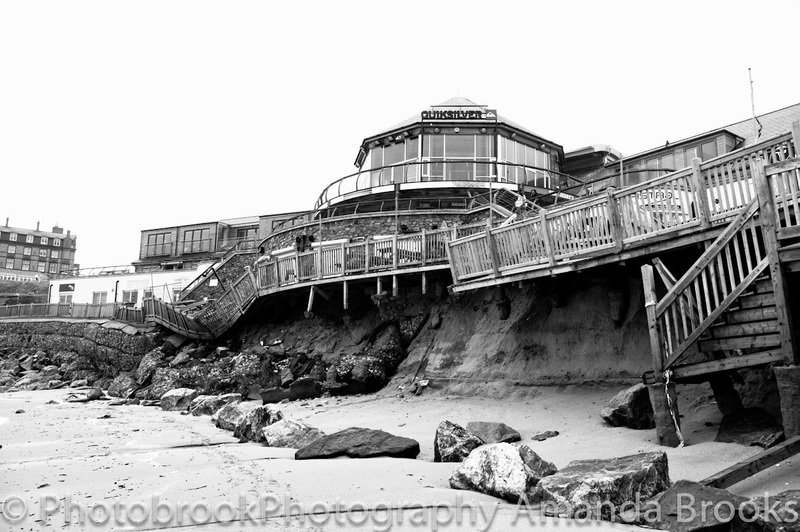 To see more photographs of the storms and the damage around the Cornish coast be sure to check out Photobrook Photography on Facebook.